Pasadena, CA – From the uncomfortable corsets and ornate bodices of the 1890s to the deconstructed freedom of the 1920s to the full skirts and bullet bras of the 1950s, fashion trends in Pasadena followed the rest of the country. This exhibition highlights women’s clothing worn from morning to night, comparing these three memorable decades. Over 40 exquisite garments from Pasadena Museum of History’s extensive Costume and Textile Collection, plus period accessories and household objects, will be featured. The Gay Nineties – brought new-found wealth and luxury to many. Women’s roles as wives and mothers began to change as rigid moral standards and stiff formal manners loosened, but clothing remained very structured with prescribed styles for every activity. A period etiquette book describes no less than twenty-four essential outfits required for various activities in a woman’s day! The Roaring Twenties – A decade of prosperity, decadence, and flamboyance. The 1920s was a time of social upheaval. In August 1920, the Women’s Suffrage Amendment was ratified, giving women the right to vote. Women’s roles in society were changing. The 1950s – American cultural emphasis was on domesticity, placing the highest value on home and family. Prosperity and consumerism defined this decade as the country returned to more traditional roles after World War II. Women were expected to be the perfect wives and mothers, important accessories to a husband’s career. Gender roles, and women’s clothing along with, became more rigid. 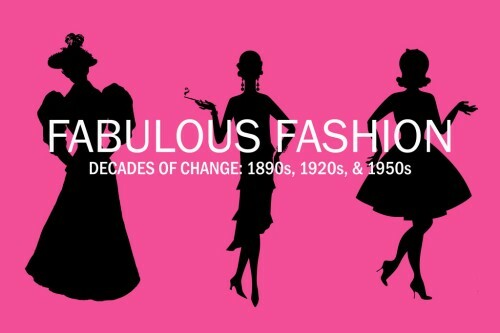 Check out the concurrent online exhibition where the public is invited to share their own family photos that showcase fabulous fashion throughout the decades! Interested in textile arts? Consider joining the Textile Arts Council. Ticket Information – Admission to the exhibition galleries is $7 per person; Museum members and children under 12 are free. Free parking in the Museum lot and on Walnut Street. Exhibition galleries are open Wednesday through Sunday, Noon to 5:00 pm. Please note that the galleries will close at 4:00 pm on Thursday, October 15. This entry was posted in Arts / LifeStyle / Travel and tagged fashion. Bookmark the permalink.